Ascaso I-Mini is special in few ways, most noticeable is that it has infinite amount of step adjustments. This can help you to really tune the grind that you desire the most. 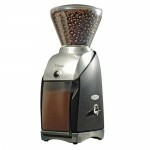 Another good things about the grinder are that it gives very consistent grind and has an attractive exterior design. Also it is good if you want small grinder which you can take anywhere with you or if you just do not want to use too much space in kitchen. It comes in aluminum or plastic body (depending on your price and quality preferences). 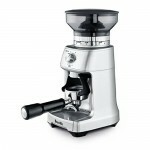 The grinder is the best for espresso, but is also good at brewing with other methods. That grinder is a smaller brother of Ascaso 2CSdb I-2. The i-Mini grinder is equipped with 38mm conical burrs that offer long term durability and can be used for a wide of coffee bean types and sizes. The burrs are slightly smaller than those of competing products. The grind is consistent, but some coffee grounds tend to get stuck in the chute. This is especially a problem at very fine grind setting (although also other settings are not perfect). It is however not too hard to clean those grounds. 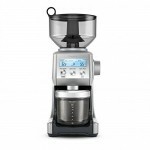 The grinder is designed for home users. Works great with a lot of espresso machines especially those made by Ascaso. The Ascaso i-Mini is designed with a coffee chute that transfers coffee from the grinding chamber into your porta filter or holding container. With a height of only 12 inches, the Ascaso i-Mini is one of the smallest grinders on the market. 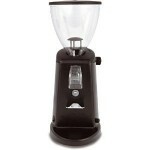 The hopper is made of clear plastic and holds approximately 8 ounces (250 grams) of coffee beans. The hopper just lifts off for washing, and the top of the grinder is easily removed to allow access to the burrs for cleaning. Make sure to remove the beans from the hopper prior to removing the hopper. 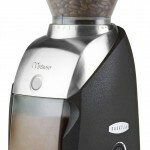 The ground coffee is dispensed directly into your porta filter handle from the chute – so it does not have grounds bean. You can dispense the coffee into a small cup or container. A knob of the side of the grinder can be turned on a continuous scale, provide an infinite grind size between the finest and coarsest size limits. Turn the knob on the side of the grinder to adjust the grind finer, or turn it the opposite direction to make the grind coarser. Ascaso refers to this as Micrometric Regulation System (MRS). The adjustment knob allows for infinite grind settings. To activate the grinder, you simply hold the porta filter handle against the button on the front of the grinder to activate the grinding mechanism. Note that grinders with the above stepless adjustment are not good candidates for grinding for multiple types of coffee brewing methods. The reason is that it is difficult to change settings from very course for French press to very fine for espresso as turning the adjustment knob countless times makes this impractical. However, to fine tune a grind for espresso, the stepless feature works great! So infinite amount of grind settings is good unless you are brewing at very different methods all the time. It is an ideal grinder for someone who wants to fine tune the grind size of their coffee to meet their flavor preferences, but it would be a good idea if they included reference marks on the stepless knob to help you recall the grind settings from each use. The grinder is made of aluminum, which means it is great for surviving long travel trips and is built to last! You can also get a slightly cheaper model (cca 20$) that is made of plastic. The hopper is made of plastic. Noisiness is not one of the advantages of the grinder. It is not extremely noisy, however it is not one of the quietest grinders on the market either! Cleaning is quite easy by just removing the hopper to get access to the burrs. However there is usually a lot to clean, so cleanings have to be done regular. There is a one year warranty on this product. There are not many Amazon customers who would have commented on the product. However on the internet many other people have written reviews which are in general positive about the product. People like the infinite amount of step adjustments, design and consistent grinding. They do not like the loudness and the fact that there are a lot of grinds left in the chute. The price of the grinder is around 260$ for the one with aluminum exterior and cca 20$ less for the one with plastic exterior. Those 20$ are definitely a tradeoff of extra quality versus price. Ascaso I-Mini conical burr espresso grinder is quite hard to compare with other grinders in the same price range because most of them do not have stepless grind settings. This can be a very good feature if you want to fine tune the grind size of your coffee to meet your personal flavor preferences. It is also not too hard to use and has an attractive design. Not good for grinding for multiple types of coffee brewing methods.